The Groovy plugin - when using the "Execute system Groovy script" step. The JobDSL plugin as of version 1.60 and later. To protect Jenkins from execution of malicious scripts, these plugins execute user-provided scripts in a Groovy Sandbox that limits what internal APIs are accessible. 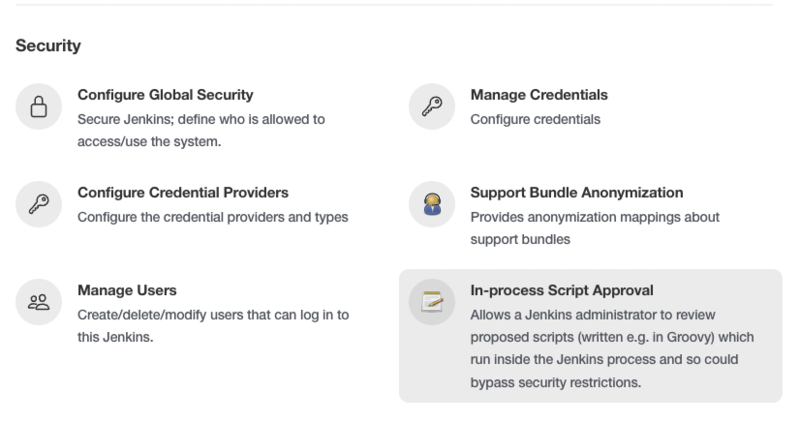 Administrators can then use the "In-process Script Approval" page, provided by the Script Security plugin, to manage which unsafe methods, if any, should be allowed in the Jenkins environment. The Script Security plugin is installed automatically by the Post-install Setup Wizard, although initially no additional scripts or operations are approved for use. Older versions of this plugin may not be safe to use. Please review the security warnings listed on the Script Security plugin page in order to ensure that the Script Security plugin is up to date. Security for in-process scripting is provided by two different mechanisms: the Groovy Sandbox and Script Approval. 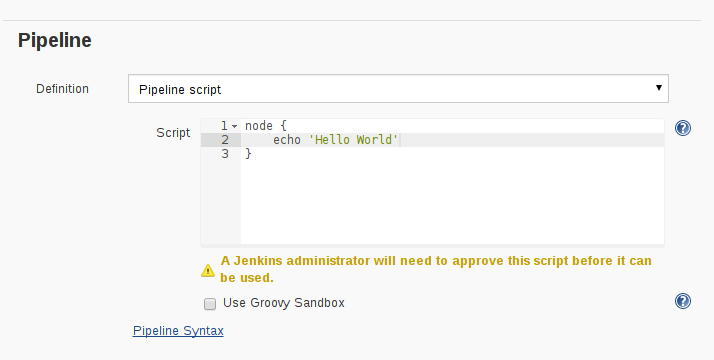 The first, the Groovy Sandbox, is enabled by default for Jenkins Pipeline allowing user-supplied Scripted and Declarative Pipeline to execute without prior Administrator intervention. The second, Script Approval, allows Administrators to approve or deny unsandboxed scripts, or allow sandboxed scripts to execute additional methods. For most instances, the combination of the Groovy Sandbox and the Script Security’s built-in list of approved method signatures, will be sufficient. It is strongly recommended that Administrators only deviate from these defaults if absolutely necessary. To reduce manual interventions by Administrators, most scripts will run in a Groovy Sandbox by default, including all Jenkins Pipelines. The sandbox only allows a subset of Groovy’s methods deemed sufficiently safe for "untrusted" access to be executed without prior approval. Scripts using the Groovy Sandbox are all subject to the same restrictions, therefore a Pipeline authored by an Administrator is subject to the restrictions as one authorized by a non-administrative user. The Pipeline above will not execute until an Administrator approves the method signature via the In-process Script Approval page. 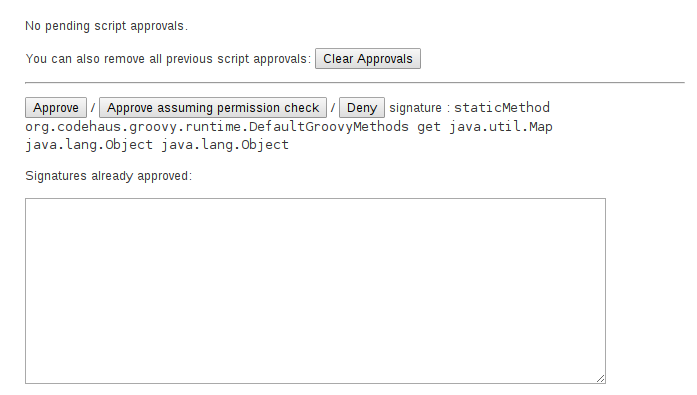 In addition to adding approved method signatures, users may also disable the Groovy Sandbox entirely as shown below. Disabling the Groovy Sandbox requires that the entire script must be reviewed and manually approved by an administrator. Manual approval of entire scripts, or method signatures, by an administrator provides Administrators with additional flexibility to support more advanced usages of in-process scripting. When the Groovy Sandbox is disabled, or a method outside of the built-in list is invoked, the Script Security plugin will check the Administrator-managed list of approved scripts and methods. Script approval provides three options: Approve, Deny, and "Approve assuming permissions check." While the purpose of the first two are self-evident, the third requires some additional understanding of what internal data scripts are able to access and how permissions checks inside of Jenkins function. Consider a script which accesses the method hudson.model.AbstractItem.getParent(), which by itself is harmless and will return an object containing either the folder or root item which contains the currently executing Pipeline or Job. Following that method invocation, executing hudson.model.ItemGroup.getItems(), which will list items in the folder or root item, requires the Job/Read permission. This could mean that approving the hudson.model.ItemGroup.getItems() method signature would allow a script to bypass built-in permissions checks. Instead, it is usually more desirable to click Approve assuming permissions check which will cause the Script Approval engine to allow the method signature assuming the user running the script has the permissions to execute the method, such as the Job/Read permission in this example.